What happens when you take the best products for ordering music tickets on the web and combine it with the best apps for discovering live music on your mobile device? Ladies and gentlemen, we’d like to introduce you to Limelight: a platform developed to allow any artist/venue to submit their show for display on both the Timbre app and SeatGeek.com. The process is easy. Simply click here and login with your SeatGeek account. 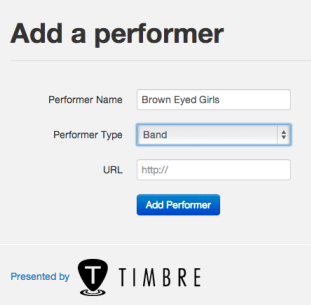 From there you’ll be prompted to add your band or venue into our system. After entering in all the necessary details, just click the “add” button – your show will take 24-48 hours to appear on the SeatGeek/Timbre catalog. Yes, it’s really that easy, and you never even had to leave your computer chair.